When someone visits www.acuriousinvitation.com we use our web host service, One and One Site Analytics, to collect standard internet log information and details of visitor behaviour patterns. We do this to find out things such as the number of visitors to the various parts of the site. This information is only processed in a way which does not identify anyone. We do not make, and do not allow 1&1 to make, any attempt to find out the identities of those visiting our website. We use a mail out provider, Campaigner, to deliver our newsletter. 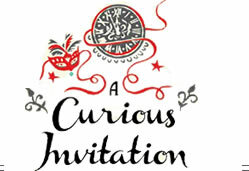 The only information we will ask you for is your email address so we can send you information on A Curious Invitation events. You can unsubscribe from this at anytime and we don’t rent or trade mailing lists with other organisations. Campaigner does gather general statistics around email opening and clicks using industry standard technologies to help us monitor and improve our e-newsletter. For more information, please click this link to read Campaigner’s privacy notice. You can unsubscribe to general mailings at any time of the day or night by clicking the unsubscribe link at the bottom of any of our emails or by emailing our data protection officer Suzette Field.